Inflatable boats that are built for fishing are economical, versatile, and a relatively inexpensive way to get out on the water. We discovered that pontoon-style inflatable boats provided the best durability and stability for fishing. The Classic Accessories Colorado XT won us over with its incredibly stable platform, storage capacity, and angler-minded usefulness. It’s more expensive than many inflatables, but it is definitely the best inflatable fishing boat you can buy. The Colorado XT can safely hold 400lbs. That is a huge capacity for a one-person inflatable. It has two pontoons for stability that are held together with a powder-coated corrosion resistant steel frame. The bottom of the pontoons are covered in abrasion-resistant PVC. The tops are tough and made of durable nylon. Two 7′ aluminum oars come with the boat. They fit into bronze oar locks that can lock the oars back in a resting position while you are fishing. The seating system is as comfortable as you can get on an inflatable. The padded seat folds down if you want it to and the footrests adjust to accommodate a variety of heights. Storage is abundant on the Colorado XT. 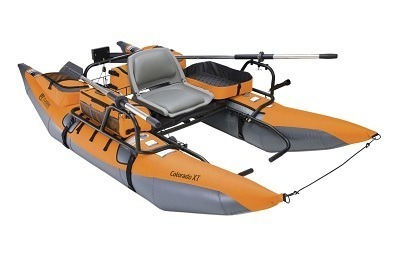 It’s one of the best inflatable fishing boats in terms of storage capacity that we have seen. There are a total of 20 removable side pockets that can be re-positioned to create a custom storage layout. When combined, the pockets can create a portable gear bag. Pontoon-style inflatable fishing boats are the only place you’ll find a wire rear storage platform like the one on the Colorado XT. If you don’t want to paddle, the Colorado XT has a motor mount on the back wire rack. The two-position mount works perfectly with an inexpensive electric trolling motor. The wire basket is perfect for battery storage. Classic Accessories clearly designed the Colorado XT with anglers in mind. A removable stripping basket is included for mounting over your lap or to the side and the three-position rod holder offers a variety of rod configuration options. Additionally, the Colorado is compatible with cleat and pulley anchor systems. There is a mount for left or right side mounting. Because the boat is almost 70 pounds without cargo weight, Classic Accessories included a fold-down transport wheel that tucks under the wire storage area behind the seat. This makes it easy to move the boat with only one end lifted off the ground. The Colorado XT is smooth on the water. Paddling is easy from the high seating position. Most inflatable boats sit too low for effective paddling. Another big advantage to the Colorado is the amount of torque you can get using the paddles. While most inflatable boats use plastic mounts fixed to a rubber inflatable surface, the Colorado paddle mounts are fixed directly to the sturdy steel frame. The amount of force you can extract is impressive and the foot rest position helps you leverage additional power. When you want to fish, the paddles smoothly rotate back where they are held out of the way. We think it’s best powered using a trolling motor. An inexpensive and quality trolling motor like the Minn Kota Endura C2 with 30 pounds of thrust can really move the Colorado along effectively. One advantage to the Colorado is a truly silent motor operation beneath the surface. Even a high efficiency trolling motor like the Endura C2 vibrates a little at the mounting point. With the Colorado XT, all of the vibrations are absorbed into the wire mounting platform and transferred quietly into the inflatable pontoons. There is no movement generated by boat vibrations when the motor is running. Everything is easy to access while you are fishing. There are a near infinite number of storage arrangements and organization options. Getting work done on the boat is easy thanks to the stripping basket. You can work to the side or quickly move it to your lap to use as a work surface. It’s expensive, but the Colordato XT by Classic Accessories is completely worth it. There aren’t many inflatable boats that can come close to surpassing its list of features and versatility. The only true downside is that you can’t fit two people on it. Aside from that, the Colorado has everything you need in an inflatable. By far, it is the best inflatable fishing boat for a solo fisherman. Our favorite features were the motor mount, paddle mounts, and storage options. Moreover, we love how stable the boat is. Most of the time inflatable boats feel flimsy as if they are about to fall apart. The Colorado XT will have you moving across the water in confidence. If you are a solo fisherman looking for an inexpensive way to get out on the water then you should buy this model.